We’d love your help. 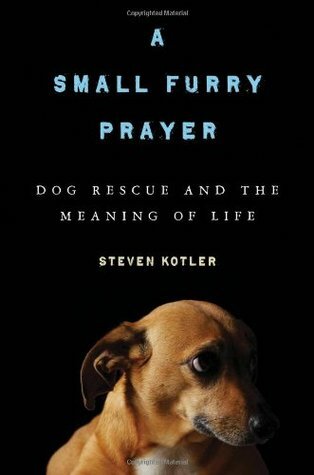 Let us know what’s wrong with this preview of A Small Furry Prayer by Steven Kotler. Steven Kotler was forty years old and facing an existential crisis—which made him not too different from just about every other middle-aged guy in Los Angeles. Then he met Joy, a woman devoted to the cause of canine rescue. "Love me, love my dogs," was her rule, and not having any better ideas, Steven took it to heart. Together with their pack of eight dogs—then fifteen do Steven Kotler was forty years old and facing an existential crisis—which made him not too different from just about every other middle-aged guy in Los Angeles. Then he met Joy, a woman devoted to the cause of canine rescue. "Love me, love my dogs," was her rule, and not having any better ideas, Steven took it to heart. Together with their pack of eight dogs—then fifteen dogs, then twenty-five dogs, then, well, they lost count—Steven and Joy bought a tiny farm in a tiny town in rural New Mexico and started the Rancho de Chihuahua, a sanctuary for dogs with special needs. To ask other readers questions about A Small Furry Prayer, please sign up. There are very few books that I finish actually speechless. Most of the time, in the course of reading, I make a few notes of things I want to be sure to include in the review. Not this one. This one swept me away so completely I could only read, I couldn't even think about the experience of reading, and reviewing was entirely out of the question. Starkly, this book is the story of what happens to one man's life when, in his 40s, he realizes that his high-flying journalist life in LA just isn't c There are very few books that I finish actually speechless. Most of the time, in the course of reading, I make a few notes of things I want to be sure to include in the review. Not this one. This one swept me away so completely I could only read, I couldn't even think about the experience of reading, and reviewing was entirely out of the question. Many books have been written about how animals have changed a human's life. But only very rarely, in my experience, are those books written by people who didn't start out as dog people. This guy didn't. He didn't grow up with dogs. He lived alone in a city without one. (Something this book caused me to realize I could never even contemplate anymore. Three months in NYC without Lily was almost the end of me). He also didn't start out as a "pack" person; he was perfectly fine on his own, or thought he was. But moving in with a pack, and then realizing he needed them -- and further realizing that they were daily expanding and deepening his worldview threw his world for a serious loop. This is the kind of book that makes you rethink your worldview in a wonderful and unexpected way. It made me realize that the times in my life I have fought depression the hardest have been the times I have tried to live pack-less. And those depressed times are peppered with my attempts to find a surrogate pack. What Kotler learned about canine and human evolution--that in a very real way we domesticated each other and evolved to live together and suffer when we live apart--made a huge amount of sense. Many of the books and much of the research he cited I was familiar with, but a lot of it was also new, and I can't wait to check it out. His writing style was wonderful. The prose was gritty, realistic, human, humble, proud, crazy, tragic and very funny. In short, it accurately reflected what I have experienced of real life. At times, he could come off a little--well, something that could probably be called credulous, overzealous, or overly-optimistic. And while I realized that it could come off that way, it did not to me. This level of epiphany cannot be counterfeited. And epiphanies, by their very nature, often imbue one with optimism and a willingness to embrace ideas you would never have otherwise considered. While I am withholding judgement on some of his conclusions, he inspired me to explore them for myself, and to think more deeply about who I am and how I fit into the world. You really can't say anything better about a book than that. I highly recommend this to everyone on the planet. Wow -- I've got a lot to say in this review, and it's hard to know where to start . . . I guess I should say first that I won this in a First Reads giveaway. Thanks! I signed up for this giveaway on a whim -- I like animals (although I prefer horses to dogs), but a memoir about animal rescue wouldn't necessarily be my first choice. But the idea intrigued me, and I figured I'd just pass the book along to my sister when I'd finished it. Well, sorry, Q, you're going to have to pick up your own copy Wow -- I've got a lot to say in this review, and it's hard to know where to start . . . I guess I should say first that I won this in a First Reads giveaway. Thanks! I signed up for this giveaway on a whim -- I like animals (although I prefer horses to dogs), but a memoir about animal rescue wouldn't necessarily be my first choice. But the idea intrigued me, and I figured I'd just pass the book along to my sister when I'd finished it. Well, sorry, Q, you're going to have to pick up your own copy -- I just can't let this one go! The book didn't click with me initially. The author seemed a bit . . . angsty to me. I'm a very happy person, so reading about his anxieties and the negativity he was experiencing at the beginning of the book was depressing, and even disturbing. I really wasn't sure if I could read an entire book filled with this seemingly glass-half-empty attitude. But I did keep reading, and as the story progressed it seemed as though the author experienced a lightening of his spirit. His focus shifted to the dogs in his care, and this part of the book became more enjoyable. It was both heartbreaking and uplifting to see the compassion and attachment this couple have with not just their dogs, but ALL dogs. I can't say I could do what they do, but it was interesting to get a first person perspective of what goes into animal rescue. The book really came alive for me when the author began writing about his research into dogs and various states of being -- he discusses altruism, sexual orientation, enlightenment, shamanism and shapeshifting, dog and human evolution, inter-species communication . . . I could honestly go on and on and on, and none of it was anything less than intriguing. I really enjoyed how he would use an experience with his dogs as a jumping off point for a scientific discussion, then circle back to the initial story. I found this made this made the technical bits more personal as I considered them in relation to the author's life. I do believe Steven Kotler has found some form of enlightenment at his dog rescue in New Mexico. I'm not sure he will ever be as emotionally strong as he probably needs to be, given the last-chance nature of the animals he works with, but it appears he's found a balance that works for him. I was recommended this book on Amazon when I was buying the book about what happened to the dogs in Michael Vick's horrible case. I had put both books on my shelf until I knew there would be a day where I could cry myself senseless and not have to worry about anyone seeing my puffy eyes. I pulled this book off of the shelf on a whim and decided to give it a go. The stories that Steven Kotler tells about the actual dog rescue and how it started was great. I volunteer at a no-kill shelter, so I cou I was recommended this book on Amazon when I was buying the book about what happened to the dogs in Michael Vick's horrible case. I had put both books on my shelf until I knew there would be a day where I could cry myself senseless and not have to worry about anyone seeing my puffy eyes. I pulled this book off of the shelf on a whim and decided to give it a go. A Goodreads friend recommended I read this book, and I must say I'm glad I did. Written by a professional writer and dog-lover, A Small Furry Prayer recounts the work of a husband and wife team of dog rescuers, a couple who adopt dogs slated for death at animal shelters in order to give them a last chance at rehabilitation and adoption, or at the very minimum a happy and loving home during their last months of life. Interestingly, I recently finished The Evolution of Brun Actual rating: 3.5 stars. Interestingly, I recently finished The Evolution of Bruno Littlemore, a novel about what it means to be human, as opposed to a "lesser animal," where the thrust was that humans are not nearly as special as they like to think they are. Steven Kotler has the same outlook on animals and humanity. He sees, in his pack of dogs, empathy, altruism, grief, homosexuality, imitative behavior, moral behavior, intelligence, abstract intelligence, language skills, laughter, even evidence of a belief in god. Between chapters recounting his troubles setting up a dog haven ranch in northern New Mexico, and his adventures with his ever-changing pack of dogs, he devotes chapters to each of the human-like traits listed above, quoting the works of philosophers, psychiatrists, and scientists who study human and animal behavior. I love dog books. I read all dog books. I read dog books from training books, to breed tomes, to stuff like Marley and Dog On It,(a good detective story by the way). If you read dog books too this book is a must. It is the best mixture of story and science about, or related to, dogs I have read in a long time. The author is a rescuer. He gets a lot of chiuauas at his rescue operation. If I never saw another chiuaua it would be too soon. In spite of this bias I loved the book and the dogs who dropp I love dog books. I read all dog books. I read dog books from training books, to breed tomes, to stuff like Marley and Dog On It,(a good detective story by the way). The author is a rescuer. He gets a lot of chiuauas at his rescue operation. If I never saw another chiuaua it would be too soon. In spite of this bias I loved the book and the dogs who dropped by, chiuauas included. This is one of the best books I've read in a long time. I laughed and cried. I didn't want it to end. Kotler didn't set out to be a hero to unwanted dogs. That role came to him, first with a dog named Ahab, then with a woman who said that to love her meant loving her dogs. But this is more than a story about dogs. It's about a man finding his purpose through and with these dogs, about what it means to be human, about compassion and love and what's truly important in life. This book touched me all This is one of the best books I've read in a long time. I laughed and cried. I didn't want it to end. I tear-stained the library copy. Having lost a dog this year ensured I'd cry reading this. Igor's story...I lost it. Lots of good sociology and biology and philosophy included. Quote near the end: Hallucinogens then do the same job as religion - they provide proof of unity, which is still the only known cure for fear of death. This is a beautiful book! Kotler is a writer who retires from modern life in order to rescue dogs with his wife. The book begins with the sort of sentimental reflections one would expect given the book title, but he quickly goes beyond into an unexpected spiritual journey. Kotler is well read and writes well. He has done a ton of research on life, the universe and dogs. As he descends into the world of rescuing dogs, he ties his experiences to philosophy, psychology and spirituality. Kotler quot This is a beautiful book! Kotler is a writer who retires from modern life in order to rescue dogs with his wife. The book begins with the sort of sentimental reflections one would expect given the book title, but he quickly goes beyond into an unexpected spiritual journey. Kotler is well read and writes well. He has done a ton of research on life, the universe and dogs. As he descends into the world of rescuing dogs, he ties his experiences to philosophy, psychology and spirituality. Kotler quotes from Descartes, Stephen J. Gould, Richard Dawkins and a variety of sacred texts and relates their ideas to his experience with a pack of chiwawas! No small feat (or feet, hahah)! I listened to A Small Furry Prayer on my commute back and forth to work. I'd find myself so engrossed in what was being said, that I'd realize 10 minutes had passed, and I had reached my destination! Not only is this a story about dog rescue, but it's also the philosophy and scientific research behind animals, dogs in particular. I learned that the panting noise my Chihuahua Zuzu makes when she's playing with me, and that she joins in with me when I make the noise, is actually doggie laughter. I I listened to A Small Furry Prayer on my commute back and forth to work. I'd find myself so engrossed in what was being said, that I'd realize 10 minutes had passed, and I had reached my destination! Not only is this a story about dog rescue, but it's also the philosophy and scientific research behind animals, dogs in particular. I learned that the panting noise my Chihuahua Zuzu makes when she's playing with me, and that she joins in with me when I make the noise, is actually doggie laughter. I learned that my Pitbull/Lab mix Mina is an altruistic being when, at 75 pounds, she "let's" 4 pound Zuzu win at wrestling. There were times that I cried. Times when I had to skip ahead to the next track because the cruelty that other people showed to animals was too much for me to bear to listen to. I don't usually like dog rescue stories because they are all allike: sad dog in dire circumstances, sad human, human saves dog and thus saves him/her self. Read one, read them all. And he likes dogs, but likes them without sentimetality, as indivi I don't usually like dog rescue stories because they are all allike: sad dog in dire circumstances, sad human, human saves dog and thus saves him/her self. Read one, read them all. And he likes dogs, but likes them without sentimetality, as individuals. He likes their dogginess: their play, their social organization, their fur, their smell. He just likes dogs that act like dogs. Starts off as a great book about dog rescue and the "magic" that is the relationship between dogs and humans. Then becomes a book about the magic of shamanism and talking animals. (No, I'm not kidding.) When it's about dogs it's great; when pontificating about the connection between souls and the universe (or whatever) it's insufferable. I expected this book to be more about dogs & rescue than all the weird ramblings it ended up being. I rarely don't finish a book but I gave up on this one. Simply amazing. So much more than a dog book, this book is so well written and covers so many areas and topics, but all ties back into the dogs. Absolutely wonderful. While the story itself was one that was entertaining and enlightening, most of the book wasn't necessarily about the story. I suppose the title really gives away what the book will be about, but more emphasis should be placed on the "meaning of life" part, since that is what Steven Kotler focused on more. The basic plot behind this book is that Steven and his girlfriend, Joy find themselves struggling financially when their landlord in LA decides to sell the property and evict them. The problem While the story itself was one that was entertaining and enlightening, most of the book wasn't necessarily about the story. The basic plot behind this book is that Steven and his girlfriend, Joy find themselves struggling financially when their landlord in LA decides to sell the property and evict them. The problem with this idea is that Steven and Joy have a handful of Chihuahuas, making it difficult to find a new rental property that will allow the amount of dogs they have. Finally, with little other option, the two find a home in Chimayo, New Mexico, a place known more for their violence and drug addicted citizens then anything else. At this point, Steven seems to know that because Joy is really the driving force behind the 'rescue operation,' so he decides to fully commit, and the two begin a bonafide rescue adventure. Up to this point, the two have really only rescued Chihuahuas, but after moving to Chimayo, they quickly find they are the only rescue in town and are soon called to pick up dogs they would not normally rescue. The story revolves around how Steven and Joy treat the rescue dogs, believing love and trust will slowly turn their sorry life around. They then try to find homes for these pups once they are rehabilitated, although they have their fair share of dogs that don't seem to change. Throughout the whole process Steven philosophizes about life and how the true meaning of life can really be seen in the behavior of dogs. Now this wouldn't necessarily be a terrible thing...if most of the book were about the experiences Steven and Joy faced as they started their dog rescue. But Steven spends much of the book talking about a quote or finding or statistic that helps reaffirm some life lesson about trust or love or homosexuality. And so the book really seems more about the studies that other people have conducted more than the start of a dog rescue. This book was fantastic. Probably one of the best books I've read in quite a while. First off, it was not at all what I expected it to be. I was expecting, admittedly, without doing much research on the book first as I received it for free, a sappy story about a dog rescue, compiled mostly of stories of individual dogs. Although there is a component of that in this book, the larger part is comprised of an exploration into the science and philosophy of animal psychology and the human/animal bond. This book was fantastic. Probably one of the best books I've read in quite a while. First off, it was not at all what I expected it to be. I was expecting, admittedly, without doing much research on the book first as I received it for free, a sappy story about a dog rescue, compiled mostly of stories of individual dogs. Although there is a component of that in this book, the larger part is comprised of an exploration into the science and philosophy of animal psychology and the human/animal bond. The book is very well researched, and much appreciated by me, the author provides and extensive references list at the end of the book. I think I will end up looking a lot of these up and checking them out. A Small Furry Prayer documents the author's journey from a dog owner to a dog rescuer. The journey he describes is largely an emotional change, as he discovers a kinship with the dogs which leads him to question common belief that animals are not sentient beings - that self awareness and emotional range are special traits reserved only for homo sapiens. He uses his stories of his experiences with the dogs as a springboard for taking the reader on a trip through his research, and what that research has led him to conclude. It was extremely interesting, and very enlightening. There were parts of this book that were so hilarious that I had to read them aloud to my husband, and there were parts that were so serious I needed to read them twice to get a full grasp. There were also parts that were terrifying, horrifying, and incredibly sad. This will definitely be a book that I will remember for a long time. I appreciated this book because in sharing my life with six animals I find myself asking some of the same questions that Kotler did. It was refreshing to read such a well researched book that followed along with my own thoughts about wildlife, farm animals and companion animals. I won this book in a First Reads giveaway, and I tried really hard to get into it, but I eventually gave up. I really wanted to read this book as I love reading books about how dogs and pets can change a person's life. But, after getting about 1/4 of the way through the book, I had had enough. I loved the fact that the author and Joy take in so many dogs, but I just could not relate to either person/character. I couldn't get past the narrator's/author's arrogance and selfishness. He constantly co I won this book in a First Reads giveaway, and I tried really hard to get into it, but I eventually gave up. I really wanted to read this book as I love reading books about how dogs and pets can change a person's life. But, after getting about 1/4 of the way through the book, I had had enough. I loved the fact that the author and Joy take in so many dogs, but I just could not relate to either person/character. I couldn't get past the narrator's/author's arrogance and selfishness. He constantly complains about not having enough money or space or whatever for the dogs. He talks about everything he had to give up when he and Joy got together, moved and started taking in dogs. When I stopped reading, he complained that he was going to spend $500 a month for dog food. While I think what he and Joy are doing is awesome, at the same time, he should WANT to do it and with that wanting comes the responsibility of paying the bills (whether it be for food or vets or whatever). If this is something they are passionate about, then they should be accepting of the fact that it may take more than they have (and either find a way to finance it) or stop taking in new dogs. I just got the impression that he thought Joy's taking in new dogs was a burden to him and his lifestyle and it was something he did not want to deal with. I often felt like he was telling this story only so he could get praise/sympathy from others for "what he did" and "what he had to give up to get there" and "what he went through for love and his girlfriend" and although I truly appreciate their efforts and wish more would do the same...it was their choice and they should do it for themselves and for the animals and not expect or want anything in return be it praise or sympathy or whatever. I won this book on First Reads and, probably with this review, will never win another one! I must say I had a very difficult time with this book. I thought it was going to be different than it was. It ended up going on very diffent tangents, from rescue, gay animals to animal psychology, with very little focused in the nuances of animal rescue. It was simply all over the place. I thought it was poorly formed and written from someone who is a professional writer. Sorry. If you have always felt that humans have a deep connection to animals, and animals are connected to us and other animals, a connection that cannot be explained... read this book. Full of amazing facts, great theories and heartwarming stories. It's spiritual, educational and philosophical. There are Chapters that will leave you with a feeling of "Huh, really??" or perhaps..."how cool is that?" what a lovely book! if you love dogs, you should read this. if you know someone who loves dogs, you should read this. if you've ever wondered why people love dogs - read this! excellent! I thoroughly enjoyed this book, at times, laughing at loud. I think Kotler is a great writer bringing you to his world filled with dogs, love, joy and pain. "Then, like now, there were some people who were better with animals than others. Until we started hanging out with wolves, these folks probably helped track game, but otherwise didn't play too much role in community life. But once we began cohabitating with wolves, such skills were greatly in demand. Those who were better with animals - who felt deeper empathy, responded more to neoteny, and- considering this is wolves we're talking about here - had greater tolerance for risk had an advantage. Tribes who had these folks around had an advantage. Thus the moment we began cohabitating with wolves became the moment evolution began selecting for those traits that made us better wolf lovers." "Humans have evolved to share their lives with dogs, and our brains are no longer cut out to do this work alone..We've evolved to cohabit with dogs. Their presence is part of what makes us feel safe in the world." "..but as the only species to co evolve with humans, dogs might be our strongest connection to that world: a superhighway to our archaic past courtesy of the one animal who was along for the whole ride." "The depth and range of the experience vary considerably, but whatever the level, flow is considered among life's most exquisite ecstasies..During a peak experience, the individual experiences an expansion of self, a sense of unity and meaningfulness in life. The experience lingers in one's conciousness and gives sense of purpose, integration, self-determination and empathy...The sense of bondedness can be both the inspiration for altruism and the result of the altruistic act." "Charitable deeds produce flow states with almost clockwork regularity." "St.Francis's Prayer is all about altruism, its key line being "for it is in giving that we receive." It's also about how to live altruistically, which Francis felt meant cultivating empathy." "While we'll never know what Francis was feeling, his faith was about unity, and his methods were of empathy. Most likely, he was feeling what Westerners call love and Easterners call compassion: a pure empathetic reverence for all life, the end result of well-trained mirror neurons, the feeling of unity. SO why did that wolf lie down at Francis's feet? Because wolves have mirror neurons too and unity is contagious, and why bother attacking yourself?" "while in a 2006..study, nursing home residents reported that spending time alone with a dog was a far grater cure for loneliness than spending time with other people. A 2007 meta-analysis published in Anthrozoos summed up this work succinctly - The company of animals provides considerable immunity from depression." While this is very old data, and likely higher now: "more than three thousand [of the 12,000 rescues in US] have freestanding buildings for their animals. One hundred and fifty private shelters and three hundred public ones have operating budgets in excess of one million dollars. In total, Americans spend about two and a half billion dollars on animal advocacy and sheltering each year"
"The neuronal circuitry behind aggression and play were completely different. When people tried administering testosterone to research animals - known to increase aggressive dominance, they found it actually inhibited play, wile drugs that curbed aggression did nothing to diminish it...so if play fighting wasn't training for real fighting, what purpose could it possibly serve? Turns out it is moral. It isnt a display of weakness, it's a display of a willingness to lose. The fact that animals self-handicap, might mean that the purpose of play fighting isn't to teach them how to win, but to teach them how to win and lose. All animals probably need to know both the dominant and subordinate role, because no animal starts on top or ends life on top." I have been turning over and over again about how to write this review. To me, there were two books in one. One book is about the personal experiences of the couple with the dog rescue in northern Arizona and the other is related or not sometimes not of philosophy of religion and animal research. The part that I enjoyed was the telling of Joy, Steven Kotler’s almost saint like wife and his relationship to her and the dogs. Both of them had chronic illnesses. She has Lupus and he has Lyme disease. I have been turning over and over again about how to write this review. To me, there were two books in one. One book is about the personal experiences of the couple with the dog rescue in northern Arizona and the other is related or not sometimes not of philosophy of religion and animal research. The part that I enjoyed was the telling of Joy, Steven Kotler’s almost saint like wife and his relationship to her and the dogs. Both of them had chronic illnesses. She has Lupus and he has Lyme disease. So both of them were limited physically in what they could do by their immunological diseases. Joy seemed to be driven in her desire to run a shelter operation. I didn’t know before reading that the many of the rescue dogs are often so feral that they could never be pets. They might seek the heat of a human’s body for warmth at night but if that human woke up and started to get out of bed, the dogs might bite them. The couple moved from Southern California to Chimayo, New Mexico soon after starting their rescue operation. Partly because the place they rented was going to be sold. I had some hunches about which dogs from shelter would be most adopted. I knew without saying that the puppies that are cute and cuddly and especially those that were already housebroken are the first to be adopted. I didn’t know that the color of the dog’s coat made a difference. When searching for a dog in the pound that would be considered a candidate, they looked for the shy, the handicapped, deaf, blind, drooling, chewy, dogs who were probably not housebroken. I learned that I probably would never be up to heartache and the disappointment of running a dog rescue operation. Joy loved the dogs so much, that it was love me and the dogs or we don’t get together. So since Steve loved her, he decided to accept the dogs and was surprised to find that he was profoundly grief stricken when they died, often of old age. Now, the part I didn’t like. This may be because of my educational background. I took philosophy and philosophy of religion course and a full year of animal behavior courses. I have also read a great deal about animal intelligence and behavior. That is why, when the author would discuss a study or an animal story, I felt irritated. When I decided to read this book, mainly because of the endearing cover of a dog looking so forlorn, I didn’t expect to review all or most of the material that I had already covered in college. I started skipping through the book whenever a study or a religion thought was discussed. If you are different from me and are interested in animal rescue operations, love dogs but haven’t read many animal studies than you will probably love this book and wonder at how many things we know about animals and dogs and familiar. But if you are already well schooled in this topic you might not learn very much from this book and will be disappointing. I received this book from the Library Thing program and that in no way influenced any part of my review. As with the other ARCs I have reviewed please keep in mind that the page count and a few details I may mention may or may not be the same as the actual text. Now on to the review. I personally did not enjoy this book the way I had hoped. The author does have a talent for writing and his style is fluid, precise, and quick paced. However, I can't stand when people interrupt stories...especially if it's their own story. There were a lot of very interesting, cute, sad, and touching stories about the As with the other ARCs I have reviewed please keep in mind that the page count and a few details I may mention may or may not be the same as the actual text. Now on to the review. I personally did not enjoy this book the way I had hoped. The author does have a talent for writing and his style is fluid, precise, and quick paced. However, I can't stand when people interrupt stories...especially if it's their own story. There were a lot of very interesting, cute, sad, and touching stories about the dogs that he and his wife fostered, but just as a story is starting and you're getting interested -pause- and the philosophy side story or research starts. After about a page or so of that you finally get back to the story but it's just not the same now that you are bogged down with a bunch of knowledge about a wide assortment of things. I suppose to be fair this book isn't purely about the dogs, it's about the lifestyle and how he grew into it. So the fact that he is thinking about how he and the dogs interact and get to know each other is a good thing, I just would have preferred if the information would have come before the actual story or after, or if being in the middle is the only perhaps if it was shorter in length. That was my major dislike. There were a few issues I had with the author and that was just a personality clash I suppose. There are a few editorial mistakes like for example the author's wife is named Joy, but there are a few times that he calls her Lila. It's not terrible but it's enough to make you backtrack to see who exactly he's talking about.Also I never want to go to Chimayo, New Mexico ever...it sounds terrible. The scenery sounds beautiful but the community sounds absolutely terrible. It may not be that way now but I'm definitely not going to put it on "to travel" list. I personally love the message that this gives though. Dog rescue is hard work and by no means pretty, but the rewards come in so many different ways. This book proves that there is a lot we can learn from animals, and there are somethings we may never understand. I can't say I recommend this because it was a bit of a tedious read but if you really enjoy books about animals and/or animal rescuing I'm sure you would enjoy this a lot. I'm still annoyed by the page where he states that Jane Goodall's educational programs for children are a failure to stay sane because she's lost faith in adults. For one thing, anyone who describes elsewhere in the book how uplifting an experience it was to have a dog vomit in his mouth because it demonstrated how intense their bond was, is in no position to be throwing about accusations of going crazy. And for another, Goodall's approach seems much more likely to protect animals in the future than trying to take in as many as you can in a two-person animal rescue. Initially, even before receiving the book, I didn't think this was the type of book I'd normally read. I actually have allergies to animals and a phobia, I must admit. Also, I haven't grown up in a family that considered pets a priority in life. However, I choose to remain open and want to be able to gain new experiences in life, so I opted to choose this book and was fortunate enough to win a copy. Well, I was pleasantly surprised! This author is certainly deep, creative, honest, and funny all i Initially, even before receiving the book, I didn't think this was the type of book I'd normally read. I actually have allergies to animals and a phobia, I must admit. Also, I haven't grown up in a family that considered pets a priority in life. However, I choose to remain open and want to be able to gain new experiences in life, so I opted to choose this book and was fortunate enough to win a copy. Well, I was pleasantly surprised! This author is certainly deep, creative, honest, and funny all in one. This book was not just about dogs. I learned some USA history; history of animal domestication, protection, and ownership; and strangely enough how human nature compares with that of dogs. I had never considered a dog other than just that, a dog! But this book brought a new perspective and not just the author's opinions, but research. Could dogs actually be altruistic in nature, do they have feelings and emotions like humans. I enjoyed this book. It made sense to me. Maybe this is why dogs are considered man's best friend, because they understand, they're intuitive. I'm glad I read this book! An engaging book, especially for dog lovers, which wasn't at all what I'd expected. I'd recently read the one about the couple who moved from SoCal to Maine with 25 rescued dogs and it was all about dogs in the here and now. In this one, the author (evidently a respected freelance journalist since clients were sending him as far as Patagonia to report of stories) becomes involved with a woman dog rescuer. Mostly chihuahuas. He talks about dog rescuers as a breed unto themselves and talks about th An engaging book, especially for dog lovers, which wasn't at all what I'd expected. I'd recently read the one about the couple who moved from SoCal to Maine with 25 rescued dogs and it was all about dogs in the here and now. He talks about dog rescuers as a breed unto themselves and talks about their move to New Mexico and the various canine characters in the story. But then he goes off on academic tangents related mostly to the relationship of wolves, dogs and humans with extensive quoting of various experts on everything from varied theories of how wolves evolved to dogs to inter-species altruism, homosexuality in animals other than humans, shamanism and shapeshifting, inter-species communication and such. Steven Kotler is a New York Times bestselling author, award-winning journalist, and co-founder and director of research for the Flow Genome Project. His books include the non-fiction works "The Rise of Superman," "Abundance," "A Small Furry Prayer" "West of Jesus," and the novel "The Angle Quickest for Flight." His work has been translated into more than 30 languages. His articles have appeared in Steven Kotler is a New York Times bestselling author, award-winning journalist, and co-founder and director of research for the Flow Genome Project. His books include the non-fiction works "The Rise of Superman," "Abundance," "A Small Furry Prayer" "West of Jesus," and the novel "The Angle Quickest for Flight." His work has been translated into more than 30 languages. His articles have appeared in over 60 publications, including The New York Times Magazine, The Atlantic Monthly, Wired, GQ, Outside, Popular Science, Men's Journal and Discover.